Monday August 7, was the final day for registration in the NFL’s “uncapped” concussion settlement, but for many players and their families, issues are far from settled. 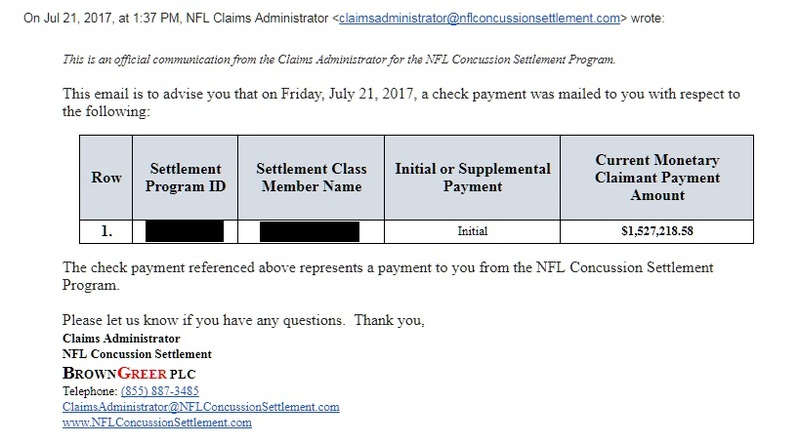 Numerous former opt-outs, who had decided to pursue their own litigation against the league apart from the concussion settlement, opted back in during the final weeks of registration. As the settlement registration cut-off date approached, however, approximately 18,400 out of a potential 21,000+ players registered with a registration rate of 87.6 percent, as sports law attorney Daniel Wallach noted on Twitter. 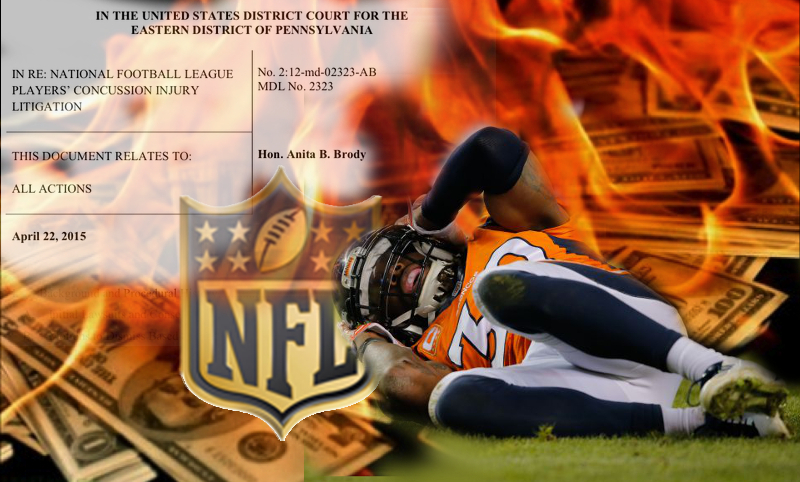 87.6% registration rate– higher than most class actions–means that the #NFL may have to pay more than expected under uncapped settlement. It does appear the NFL may perhaps pay out more than initially anticipated, but many questions still remain, including how much of the payouts the players and their families will actually receive. After offsets and liens are assessed, however, the amount of the award a player will receive is questionable. Here’s one family’s story to date. Names have been redacted to preserve their privacy. In May, a player, who is living with amyotrophic lateral sclerosis (ALS) received a letter from the settlement’s lien resolution administrator stating that he would receive $4.5M as designated for those in the 45-49 age bracket. He was also told that there might be medical liens which the court-appointed lien administrator, Garretson Resolution Group could negotiate for the fee of $750. 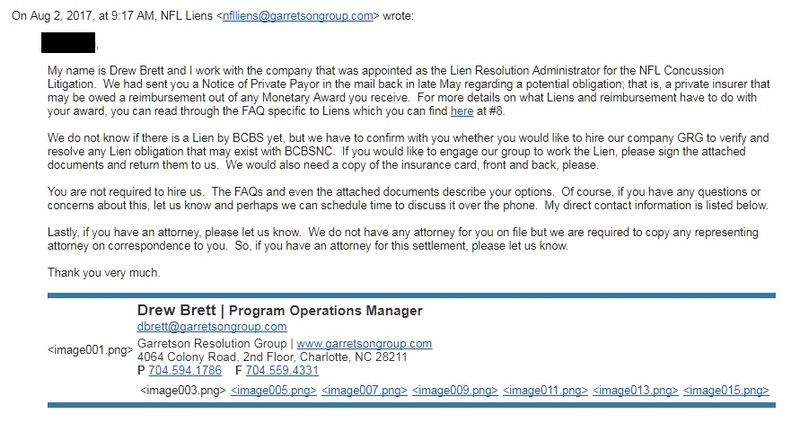 In July the retired player received the following email to notify him that a check was on the way. His wife called the claims administrator to inquire regarding the unexpected deductions, which reduced the award a whopping $2,972,781.42. The $2,704,031.42 holdback was for unresolved liens; about $2.2M of which she was told was deducted for Medicare; the remainder an attorney’s lien. 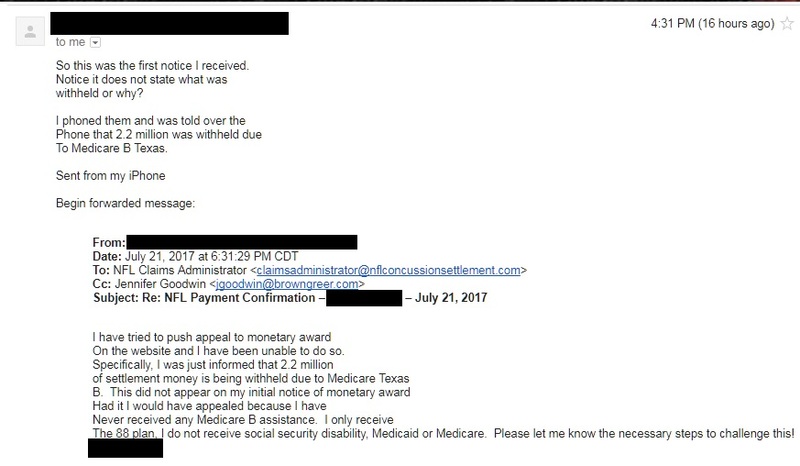 This player has never received Medicare or Medicaid; his bills have been paid through a combination of the NFL’s 88 Plan which provides benefits for players diagnosed with severe neurodegenerative diseases, and private insurance through his wife’s employer. The wife, who is an attorney herself, called the claims office to report the error. She was told that she could begin an appeal online. She tried unsuccessfully to do so. She shared some of their correspondence with the claims and lien administrators with Advocacy for Fairness in Sports. 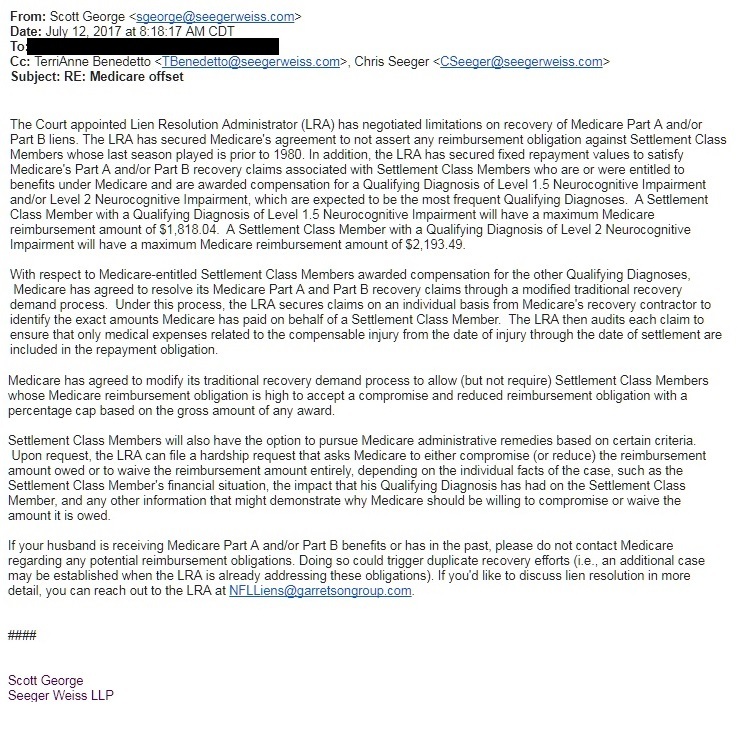 At this point the couple still have no idea as to why Medicare was deducted from their award, and they were passed from the claims administrator to the lien administrator, who told them that he was obligated to withhold funds for Medicare repayment. She told me that since the above email, they’ve supplied the requested information but have heard nothing back. I asked her if she thought the decimated amount of the award would be beneficial and she thought about it. She said it will help to replenish their children’s college fund that was depleted from out of pocket costs for stem cell treatments. She said they’ve also considered using part of the money to build lifts to insure that her husband is comfortable, but conceded that the house may not be in their future for much longer. But she also said that their medical costs have gone up due to the fact that her husband was recently placed on a ventilator and a feeding tube. “Now I am faced with I might need to leave my job to help take care of him,” she said. “I’m thinking of moving back home to get assistance from my family for him and my special needs son. I think my family would help me.” She considers herself fortunate in that her family seems willing and has the means. A lot of other players and their families aren’t so lucky – if indeed you can call it that. Prior to the beginning claim payouts, most experts thought those with ALS, Parkinson’s Disease, and Alzheimer’s would fare reasonably well, while those with dementia would be under the crosshairs for approval. Dementia Levels 1.5 and 2 are defined by the settlement and are not uniform medically accepted standards. The diagnosis leeway this potentially presents is causing apprehension among many players and their families because of rampant denials on the part of the Bert Bell/Pete Rozelle Disability plan. Although the physicians selected to evaluate concussion settlement claimants are said to be “independent” many retirees fear they will see more of the same types of denials as when sent to NFL physicians. While the Medicare deduction caps of $1,818.04 and $2,193.49 for dementia claimants seem reasonable, if the ALS claimant that I spoke with is typical of the higher award determination deductions, and if a percentage cap was used in the amount withheld, then the amount seems excessive. At one point a cap of 29 percent was implied, however if that percent had been deducted from the ALS claimant, the amount of the deduction would have been $1,305,000 instead of the $2.200,000. As of publishing, I’ve seen nothing to indicate the same type of negotiation with private insurers who will surely have their hands in the pot as well. The ALS claimant’s wife pointed out that while the $750 offer to negotiate with their insurer was a comparatively nominal fee, it appears to represent a conflict of interest for the lien administrator to be offering additional paid services to class members. She also noted that should half of the class members choose to accept the lien administrator’s services, he would make an additional $6,900,000; an amount greater than the highest possible claimant award of $5,000,000. For now, there appear to be many unknowns. Hundreds if not thousands players have been solicited by attorneys who offer lower contingency fees to try to steer them from their original counsel; this action would more than likely leave the retirees owing fees to two attorneys. Other players have been approached by “claims services” offering to fill out their paperwork for 15 percent. Others have been lured into dangerously high-interest loans from settlement funding corporations that would likely eat up any remaining money awarded after medical and attorney liens and possibly other liens such as back taxes or child support. Judge Brody has scheduled a hearing on September 19 to hear evidence on deceptive practices targeting neurologically impaired class members. Until then, one can only guess as to her determinations. And as to how much the settlement will benefit those it was originally designed to help is a question that remains to be answered.